1931 Milan Goldschmiedt is born in Zagreb on 7 November. 1944 At the age of 13 he paints his first oil painting, Paesaggio con la grande mela, which already has a clearly surrealist flavour. 1948/50 Goldschmiedt starts experimenting with illustration and caricatures, working for the satirical weekly Kerempuh and the newspaper Vjesnik, while attending secondary school. He joins the group of artists who founded Duga Film, which will subsequently become the famous school of modern animation. 1952 Goldschmiedt immigrates to Italy, where he settles permanently in Milan. 1953/56 He works on animated films and also produces comic strips. He works for several Milan publishers and for the set designer Ezio Frigerio. 1957 He commences a long series of travels across the United States, Mexico, Argentina (where he produces a series of animated films for local television companies), Britain, Germany and France. 1959 He returns to Rome, abandoning animated films and concentrating on advertising graphics. During the same year he also experiments in the sphere of publishing, with the release of Audioscope, the first Italian talking magazine. 1960/66 He works as art director for several advertising agencies. He frequents Brera, where he meets Carlo Carrà and Roberto Crippa, becoming a close friend of the latter. These are the years of the Bar Giamaica in the Brera district of Milan. 1967 He meets Augusto de Marsanich, who will later become his patron, and marries his sister, Marina, the following year. 1974 He abandons advertising graphics and design to dedicate himself completely to painting, which he defines as “alternative realism”. 1975 This is the year of Goldschmiedt’s first solo exhibition at the galleria Il Cannocchiale in via Brera in Milan. The famous art dealer Emilio Sasso visits the exhibition and enthusiastically purchases all the works, signing a six year contract with the painter. Other solo exhibitions follow during the same year. 1976 Goldschmiedt’s work first appears at auction. Brerarte sells Composizione, a silk screen print measuring 40x40 cm. 1977 Goldschmiedt’s first monograph is published by Alfieri & Lacroix. Solo exhibition at the galleria Toninelli in Rome with catalogue by Enrico Crispolti. 1978 Solo exhibition at the galleria Toninelli in Milan. 1979 Goldschmiedt produces his first “clock-painting”, a divertissement, which is nonetheless highly successful and will be repeated in the future. 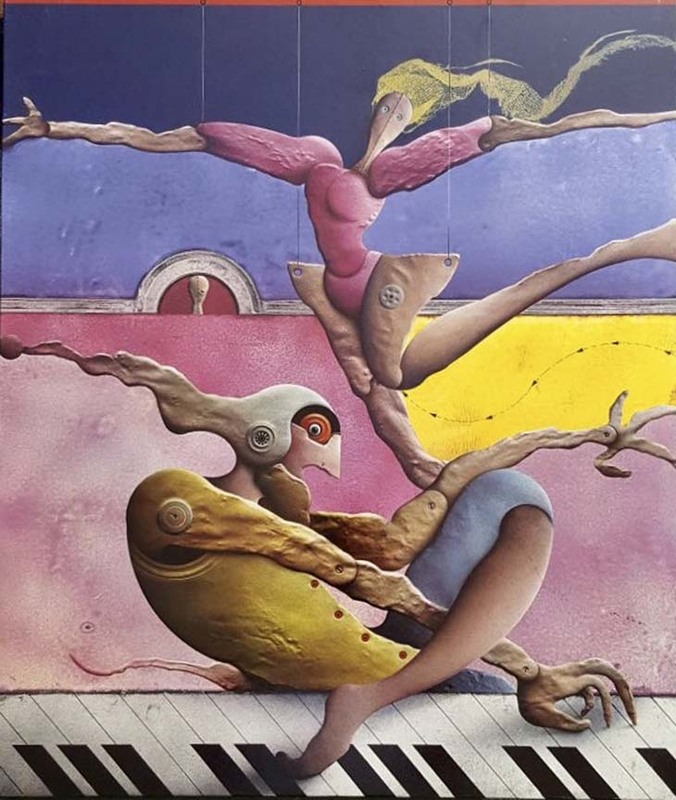 1980 A limited edition of 130 portfolios of 4 seriolithographs entitled Analisi ottanta is released, which soon sells out. 1982 Goldschmiedt’s work is mentioned in the Catalogo d’Arte Moderna Italiana edited by G. Mondadori. 1983 The artist visits Caracas, in Venezuela, for the solo exhibition entitled Obras superiores. 1984 It is a year of deep meditation. He temporarily abandons figuration and “narration” in search of greater “synthesis and equilibrium”. He produces very little. 1985 The 12th Milan Triennale invites him (as one of the 14 most famous graphic designers in Italy) to participate in the design of a new logo. 1986 Goldschmiedt produces his first bronze sculptures. He is granted Italian citizenship by the Presidential Decree of 10 February. 1987 Anthological exhibition at the Civica Galleria d’Arte Moderna San Paolo in Macerata. At the same time the galleria Il Cannocchiale presents his work at the Biennale Internazionale d’Arte Contemporanea in Milan, with a personal pavilion. 1989 Goldschmiedt participates in the 31st Biennale Nazionale d’Arte (Permanente) in Milan. Important anthological exhibition at the Casa del Mantegna (Mantua). 1990/92 These are particularly active years, whose production is encapsulated in seven solo exhibitions in leading galleries, in Italy and abroad. 1993 Goldschmiedt designs the first poster for the Salone Internazionale del Giocattolo tradefair, which is extremely successful. He is also awarded the same commission for the following years. His work starts to arouse the interest of American collectors. The Centre International de l’Art Fantastique in Gruyères (Château de Gruyères, Fribourg, Switzerland) invites him, along with other internationally renowned artists, to participate in a themed exhibition. He will also be the guest of honour in subsequent years. The Gruyères Museum stages a permanent exhibition of Goldschmiedt’s work, purchased over the years, in a prestigious room of the castle. 1995/98 Goldschmiedt is very active at international art fairs, such as those of Geneva, Gand and Bari, and has two solo exhibitions at the Arte Fiera in Bologna. 1999 The artist visits Shanghai for his first solo exhibition in China. 2000 After 50 years away from his hometown, he returns to Zagreb as guest of honour at the World Festival of Animated Films. 2001 Lingotto Fiere in Turin commissions him to design the poster for the first Salone Internazionale del Vino. The same commission will subsequently be awarded to other famous artists over the following years. 2002 Following the great success obtained the previous year, Lingotto Fiera presents the same poster again in 2002 and 2003. 2004 A year of deep meditation and the first experimentation with the new mixed technique. Is this a temporary or permanent interruption of the “old” pictorial technique? The artist himself doesn't know the answer. 2006 Return to sculpture, with new bronze casts. 2007 The creation on the most complete Mongraphy about his intense artistic life. 2008 Return to the painting with a new vision of mystical messages. 2010 He pass away at the end of August leaving a great heritage to the Art history with his unique and distinctive masterpieces. 2012 Galleria Cappelletti in via Brera (Milan) host a marvellous exhibition on his honour. 2013 Contemporary Art Biennale in Florence recognize the Artist with an award to the Memory.